I’m beginning to see glimpses of a more healthy marriage… and I am expectant on many levels. Wayne is more willing to step forward because I’ve been more willing to step back. I don’t have to bite my tongue or look the other way as much these days. Letting him handle more duties in the family is starting to feel more natural. I’m not as much of a control-freak as before this journey. God is showing me His heart for Wayne. Are you seeing the same in your home? At this point, we should be noticing some changes in both roles – husband and wife. There should be some new patterns developing. If this hasn’t been your experience, ask God to reveal why not. Since He authored marriage, He’ll gladly show you. Maybe you are late to the party and need to catch up on our quest to become surrendered wives. If so, here’s a quick list for you. We have determined that surrendering is a heart issue. We have recognized the vital role our girlfriends play in keeping our sanity. I wonder what’s been the most challenging area for you to surrender. I’m curious to know where you’ve run into the most difficulty in changing behaviors or thoughts. Have there been revelations through this process that have caught you off guard? You know what’s been the hardest part for me? I’ve been a little surprised by what God has exposed in me through this surrendering process. Did I really think this was going to be… easy? Painless? Quick? Yes… and sometimes being an optimist is irritating. To be honest, had I known just how intense this journey was going to be, I might not have chosen it. If I’d realized beforehand how much this would require of me, I would have thought twice about it. I truly believe that His plan – from the beginning – was for me to face some of my own… stuff. But knowing His plans are always to prosper me… to free me… to heal me… to restore me… I trust I’m in good hands. God’s revealed some issues that need attention. He has shown me areas of unforgiveness. He’s opened my eyes to some relational dysfunction. He has uncovered some old wounds that need healing. Because God wants me to be wholehearted. He wants me to be… genuine… unreserved… and complete. He wants the same for you, too. God loves you too much to leave you where you are, because He created you for more life than you’re living right now. So when we open ourselves up to the idea of being transformed – like we’re doing in this journey to surrender to our husbands – He takes that as a go-ahead to renew us. He uses the opportunity to make us whole. But… all those great things require a lot of hard work, humility, forgiveness and introspection. Are you finding your walk to be the same? When I’ve been discouraged in the process, the Old Testament book of Habakkuk has brought me comfort… because this prophet wasn’t afraid to ask God the hard questions. And when he did ask God how and why and when… God answered him. He boldly and confidently took his complaints, frustrations, confusion, and thoughts directly to God. His experiences remind me to do the same… and to then expect answers. As God’s been gently revealing stumbling blocks in my ability to surrender, I’ve asked Him tough questions in response. God, where were you in that situation? Why did you allow those hardships? Why was it okay then but not now? How was that part of your plan? I’ve asked in anger… in tears… in humility… in thanksgiving. And God has answered me. We’ve been working it out. I’ve been given precious insight, helping me understanding my need to control. God’s been healing those places that have kept me from fully trusting others. He’s gloriously restoring my joy. And slowly but surely… I am growing into the Godly wife He designed me to be. 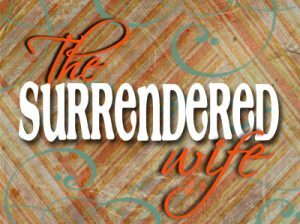 An essential part of being able to surrender to your husband… is to first surrender to God… and allowing Him restore you to who you were created to be. So sisters… what is God revealing to YOU about YOU? REALITY CHECK: When you open yourself up to be transformed, expect God to be the first in line. What a great post Carey, and what a blessing of a journey with you! God has shown us how our relationship is unique and where we need work, some places had more work revealed as we cut through to the deeper things. We are stronger in the broken places and still working on the things we thought were good and really were needing to be better. I know my strengths better now, and where God wants me in my marriage. Outside my comfort zone in a lot of things but still within His love and grace. Thanks Carey for being an encouraging friend and supporter for all who read your blog. Bright blessings, always and in all ways. Shanyn, I love that God is opening your eyes to challenges and blessings in your own marriage. What a gift! “And God has answered me. I so relate to these words of yours – He is answering us – He is working it out – we are surrendering and learning to TRUST the God who created us – and in trusting him with our everything – we can grow in trust of others… You look beautiful in your vulnerable places – and I love your heart and how you share it – your desires and your realness – such a treasure… thank you! Thank you, AB! It’s been an interesting journey, indeed! I certainly don’t think it’s a coincidence that I came across your writings about surrendering. I’ve had the hardest time with my role, feeling like I’m all alone, feeling like I’m responsible for EVERYTHING at home, compounded by this being our first year to homeschool, it’s been overwhelming to say the least. But at the same time, I’ve been very convicted about my feelings of anger, resentment & frustration towards my husband & even my 3 beautiful boys (8, 6, 22 mths). Thankfully my husband is very supportive & compassionate. I’m not sure where God will take me on this journey, but I’m positive it will result in our marriage & family being stronger & Him receiving all the glory. I’m looking forward to reading all of your posts on this topic & just wish I’d found them sooner. I just want to thank you again for sharing this journey with all of us. What a blessing it has been to not be alone in walking this path of surrender. Every morning in my journal I find myself writing, again, that I surrender my own ideas, opinions, my time, my heart, my roles as wife and mother, my whole life to Jesus. I surrender. Time and again, He shows me more that I’m trying to hold on to and control! It runs deep, and many of those journal pages are tear -stained as I let go of my “fair button” and the way i think things should be, and simply learn to trust Him. There is so much that I resonate with in every post, Carey. Thank you.